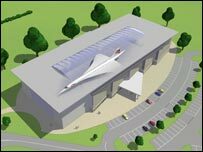 A site for the £12m visitor centre and permanent home for Concorde 216 has been offered at Cribbs Causeway. The supersonic 200 ft airliner will be the centrepiece of the attraction with exhibits, displays a shop and cafe. Concorde 216 made the final flight of any Concorde anywhere in the world in November 2003 when it flew back to Filton, where it was originally built. An application for outline planning permission is to be submitted to South Gloucestershire Council. Concorde 216 is currently situated close to the south side of the Filton runway within the aerospace plant. The site offers limited visitor access as it is within an operational factory site and because it is too near the runway for a building to be erected over it. The new site - next to the Hollywood Bowl at The Venue - provides much better access for visitors. It is also in easy sight of the runway, from which each of the British-assembled Concordes made its first flight and the hangar in which they were assembled. 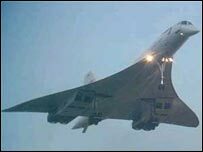 Martin Fausset, managing director of Rolls-Royce in Bristol, said: "Concorde is a fantastic example of the skill and innovation of Bristol's aviation industry. "It's important that she is preserved and accessible, both as a tribute to those who built her and as an inspiration to the engineers of the future." Rolls Royce designed and developed Concorde's Olympus 593 engines, in collaboration with Snecma of France. Assembly and testing of the engines was carried out at the Patchway plant that is now home to the company's defence business.